It’s one of America’s most popular meats, attaining “sizzling” cult status over the past few years. You can now find everything from bacon bubble gum to bacon ice cream to bacon-flavored rolling papers. Yet bacon has been one of the hardest meats for the veg industry to replicate. There’s MorningStar Farms Bacon Strips, which smell and look remarkably like bacon – right down to the streaks of “bacon fat.” But these Morningstar Farm bacon strips contain egg whites, food coloring, and numerous chemical additives I can’t pronounce. There’s Light Life Smart Bacon, which is vegan but unfortunately doesn’t resemble bacon in taste or texture. It’s more like pastrami. And then there are all the different brands of tempeh bacon, which I personally have never understood since the texture of tempeh is absolutely nothing like the texture of bacon! 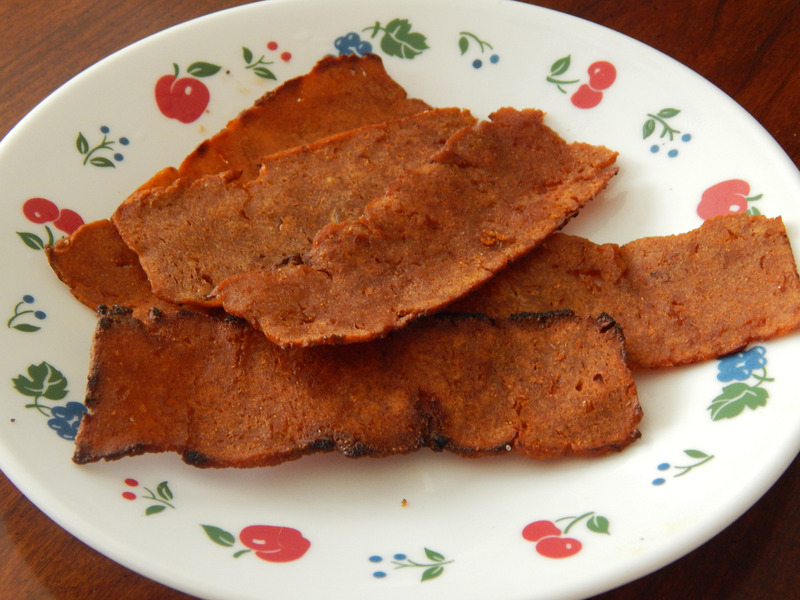 Now there’s a new contender – Upton’s Naturals Bacon Seitan. This is quite simply the best veggie bacon I’ve tried. The paper-thin strips have a smoky, salty taste and fry up very close to the texture of bacon. Crispy and crunchy and, if you do it just right, slightly chewy in the middle. One caveat: There’s a slight learning curve the first time you cook this “bacon.” Expect to burn a slice and undercook another before you achieve that perfect bacon texture. 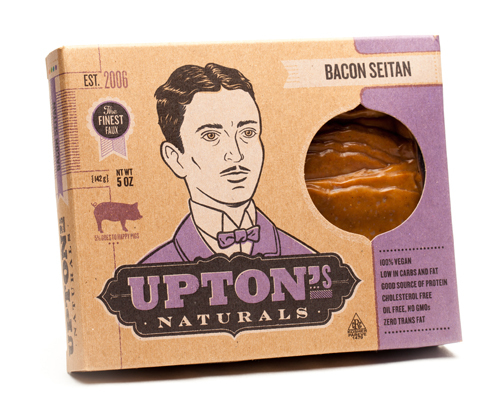 And Upton’s Naturals Bacon Seitan is made with “normal,” recognizable ingredients: Vital wheat gluten, soy sauce (water, wheat, soybeans, salt), whole wheat flour, natural hickory smoke concentrate, paprika, sea salt, onion. No food coloring! No disodium inosinate, disodium guanylate, TBHQ, or cyanocobalamin! And, as a final bonus, 5% of every package of Bacon Seitan you buy goes to the “happy pigs” at Farm Sanctuary. How cool is that? If you’re in Charlotte, NC you can find Bacon Seitan at the Ballantyne Earth Fare. (The SouthPark Earth Fare carries some Upton’s Naturals products, but I’ve not seen the Bacon Seitan there yet.) Or you can order online from Vegan Essentials.